Since Scaled Agile has supplied the metaphor, let’s examine it a little more closely. There are plenty of analog tools doctors use to assess the state of your heartbeat. Pressing their fingers to your wrist to check your pulse is a classic way to measure heart rate. Listening to your heartbeat through a stethoscope can tell doctors a lot about the health of your most important organ. If so, you should probably find another doctor. With the tools of modern medicine at their disposal, doctors now have many sophisticated ways to check in on the old ticker. Using an EKG, for example— the thing that makes beeping noises in all your favorite medical dramas— doctors can constantly monitor patients’ heart rates, receive alerts if anything changes, and make split-second decisions based on feedback from this advanced monitoring tool. All of this is a long-winded way of saying: while the pen, paper, and string you use for program increment planning are effective, there are now more advanced tools built specifically to help you create, track, and update your PI plan more quickly, effectively, and accurately than analog tools. I’ll outline and discuss just a few of the reasons why you should move from your classic sticky-note-and-yarn method to completely digital program increment planning. Creating a digital version of your PI plan is just like hooking your whole ART up to an EKG. Once you’ve heard input from every team and created your digital board, it’s always there for you to check in on. It alerts you when deadlines are coming up fast or when you’re behind. You can make immediate changes and adjustments once you’re alerted to any issues. In the meantime, your teams can focus on their tasks at hand, while still having the capability to check back in on the bigger picture at any time. Check out just a few of the ways that digital program increment planning can help your team do their best work. Especially when it comes to PI planning, where your whole ART should be present to provide input, using a digital tool that many people can access simultaneously means more people can contribute. While a digital program increment planning tool might not provide the same satisfaction as smacking a Post-it on a physical board, it accomplishes your main goal much better than a physical board does: more people can see and add to your PI plan. Especially if you’re working with distributed teams— or are simply an office that’s caught up with the digital age and allow your employees to work from home occasionally— digital program increment planning boards allow remote team members to join in on the conversation. You might still struggle with who’s turn it is to talk during a video conference call, but at least everyone will be on the same page with your PI plan. A digital PI planning board also allows for collaboration to continue once your planning session is done. Teams can access it with the click of their mouse, from home or at their desks, at any time of day. Employees can comment on or suggest changes to the board whenever they think of an idea or something you might have overlooked in your first round of planning. The possibility of constant communication from all elements of your ART helps strengthen cross-team collaboration and provides team members with a platform to submit comments, changes, or concerns. An effective digital PI board also communicates back with you by alerting you to planning conflicts and dependencies. One of the huge complaints about the modern enterprise is that information gets siloed between different departments and teams. One of the ways to combat siloing is by putting information in a digital tool, accessible to all. In addition to constant communication, a digital program increment planning board also allows for constant visibility into all team activities and milestones. While a physical board in the middle of your office can accomplish some of the same goals, there’s no denying that simply clicking a link on your own computer to verify projects, features, and user stories is easier than trekking over to your string-covered PI board to hunt down information. And remote team members aren’t left to work off of the photos someone took of the board with their phone. 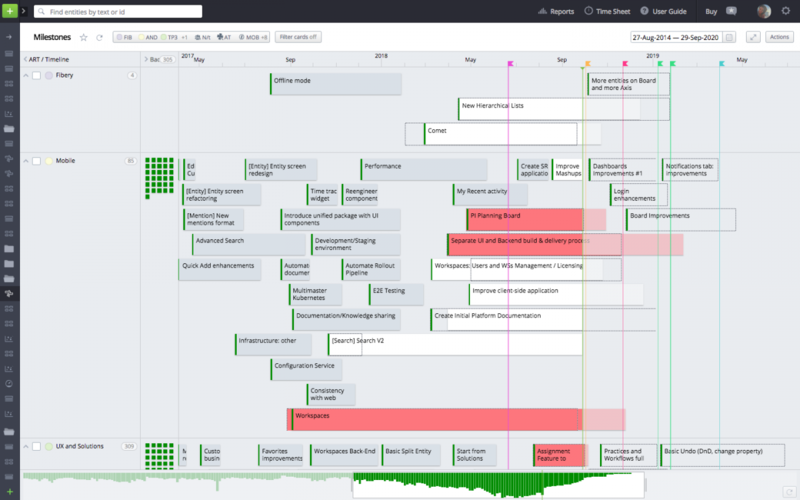 Instead, everyone can easily visualize larger projects, dependencies, and milestones, all in one place, at all times. Your team can view inter-team dependencies, as well as planned deadlines, in an effective digital program increment planning board. While the analyses and observations that come out of PI planning are useful and necessary, returning to the PI planning board can result in information overload. You’re planning for a whole PI, after all, and there are a lot of moving parts to keep track of. With a virtual board, however, teams and employees can filter out all the noise to find their individual tasks while still having access to your enterprise’s larger goals and projects. Being able to keep your eyes on everything— from day-to-day responsibilities to organization-wide efforts— ensures that people can always see what’s important to them, specifically. 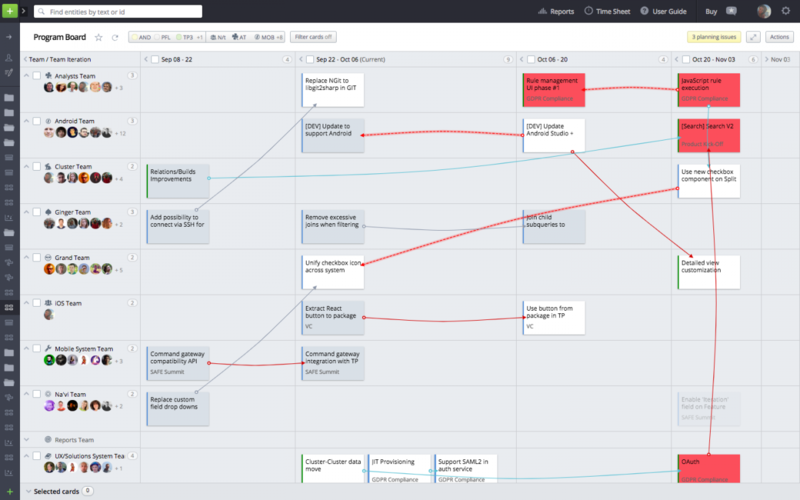 One of the great things about program increment planning boards is that they allow you to visualize everything and create a roadmap for your team. But with a physical board, the old saying applies: out of sight, out of mind. If your PI planning board isn’t right in front of you— or if you don’t go back to check it every so often— you’re bound to forget a project detail eventually. Even if it’s a crucial task, you can get so wrapped up in the user story you’re working on that other important deadlines can slip your mind. However, when you create a digital version of your PI plan, you have the added advantage of being able to filter through to your personal tasks, as well as set your system up to receive alerts and notifications when you’re approaching critical deadlines. A digital program increment planning board can immediately show you where your ART is running behind schedule or where you’ve missed milestones. You’ll also be able to more easily find and track tasks or projects that you haven’t yet committed to. No more stray Post-it notes with no strings attached! No more unresolved deadlines or unclear assignments. And no more sudden rescheduling when you realize that a critical task has been overlooked. Plus, a digital PI plan can emphasize important program dependencies, making it easier for various Agile teams to update other teams on their progress or make changes to your existing schedules and deadlines. The bottom line is that physical program increment planning boards are difficult to maintain. One change can mean rearranging your whole board. This doesn’t just happen after the program increment planning process. During PI planning, when you’re trying to readjust timelines, schedules, or expectations, you might find that it’s difficult to rearrange all your sticky notes and yarn threads mid-planning process. And let’s talk about how hard it is to move your PI planning boards once you’ve finished planning. To make your board more visible, you’ll likely have to move it from the room where you did your planning to a more central part of your office. But even something as small as one wrong step can send your Post-its and strings flying. Or if you're creating a digital copy of your physical board after your planning session, good luck getting through all that duplicate effort and data entry. The difficult and time-consuming nature of maintaining your analog PI planning board is one unnecessary bottleneck in your process. 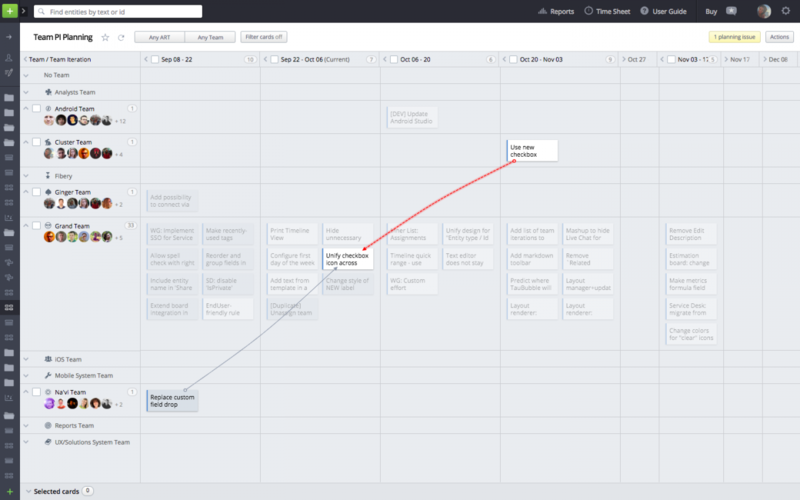 While planning will still take up a fair amount of time— two days if you follow Scaled Agile’s suggestion— you can better use that time to innovate and make sure you’ve covered all your bases. And when you make changes and adjustments, you won’t have to spend even more time re-planning and rearranging to visualize and document those changes. Is your program increment planning as effective as it could be? What kind of Agile doctor are you? The kind that puts a finger on your team’s pulse and calls it a thorough diagnosis? Or the kind that tracks and monitors everything, big and small, to make the best decisions possible? You can resort to antiquated analog methods when you’re satisfied with just getting a sense of your ART’s larger plan. But if you really want to know what’s going on— and when you want everyone involved in your PI to have that information, as well— it’s time to bring your teams into the digital age. Targetprocess can help make you the best Agile physician in your field, with customizable project, program, and portfolio visualizations and a tool that specifically helps you with program increment planning. You can see some of what our tool can help you do in the screenshots shown above. Or you can see how thorough it is for yourself by signing up for a demo. More interested in portfolio management? We have those tools, too! Need help selling your boss on a new Agile tool? Check out our business case template.